Millions of years ago, Ginkgo trees existed the world over. Today’s trees are living survivors of the dinosaur period and have changed very little since then. Although almost all Ginkgoes have eventually disappeared from the wild, some were grown and preserved in the temples of China, Japan and Korea. They are the source of all those we have today. Ginkgo is derived from the Japanese word “ginkyo”, meaning "silver apricot", referring to the Ginkgo fruit. While somewhat obnoxious in its odor, the fruit is eaten in Japan. The Ginkgo can have a long life span, 1,000 or older. In China the oldest Ginkgo is about 3,500 years old! Ginkgo (Ginkgo biloba) At 20 years height of 20’ with spread of 10’. Mature height 35 to 50’ with spread of 30 to 40’ Zones 4 through 9, full sun, takes any soil including clay or sand. Does not like smog. The Ginkgo can grow to 100 feet but usually grows from 35 to 50 feet tall depending on conditions. It will usually grow to 30 or 40 feet wide. 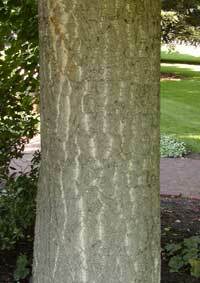 The shape of this tree varies greatly, from varieties that are spreading to others that are quite columnar. Related to conifers, Ginkgoes have distinctive fan-shaped leaves. They resemble those of the maidenhair fern, which explains their common name the “Maidenhair Tree”. Like the Quaking Aspen, the leaves will flutter in the slightest breeze. The green leaves turn a vivid yellow or golden in the fall, but the show does not last very long. They can drop all of their leaves in just one night. The Ginkgo has inconspicuous green flowers in the spring, with a mild, pleasant fragrance. The fruit however is not considered by most to be anything but a problem. The plum-like fleshy covering of the nut has a strong and very offensive odor appearing in the fall. We are talking about is a fruit that is the size of a grapefruit. When those suckers spread all over your yard, you will not likely be happy. In addition, the fruit can cause dermatitis in some folks. It is best to stick with buying only the male trees. 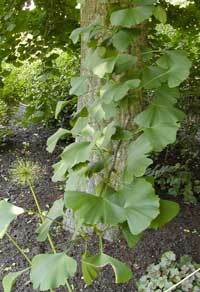 Over the years, the Ginkgo has become a major source of herbal potions and medications. The leaves are harvested on the farms in South Korea, Japan, France and the USA. They are then dried, pressed into bales and transported to the manufacturers in Ireland, Germany, Switzerland and France for the production of the extract to be used as a phytomedicine or supplement. It has now become a popular herbal supplement, even prescribed in Germany by general practitioners and covered by national health care insurance. In 1993 German sales were $280 million, with more than 5 million prescriptions written each year. In France it is also prescribed and in the Netherlands it is prescribed for pain-free walking. Until now in the USA it is primarily sold as a herbal dietary supplement in drug stores, supermarkets, vitamin shops, nutrition centers and on the internet for use to improve memory and mental clarity and for its antioxidant function. Today many vitamin/mineral supplements contain a low dose of the extract. There is recent research that provides promising evidence that taking Ginkgo biloba can improve memory and overall function for people with dementia.